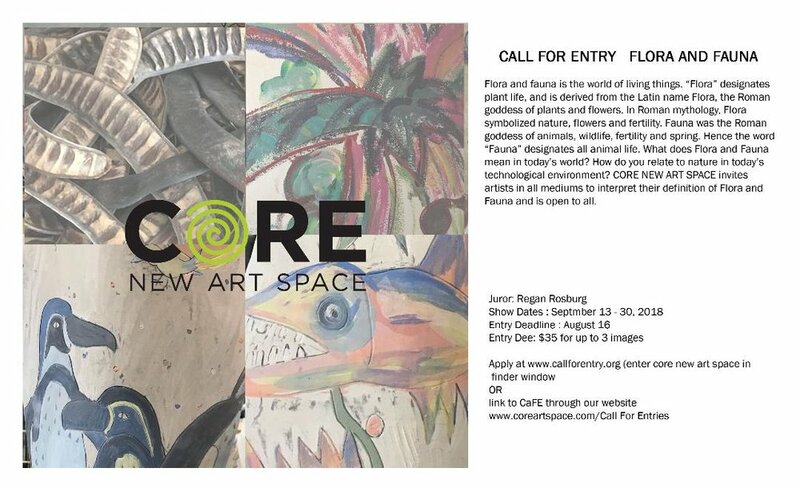 CORE New Art Space: JUROR for "Flora and Fauna"
I will be the sole Juror for Core New Art Space's upcoming exhibition, Flora and Fauna. Apply on Cafe Arts! All medium accepted. Deadline is August 16, 2018! "...Flora and Fauna is the world of living things. Flora designates plant life, and is derived from the Latin name Flora, the Roman goddess of plants and flowers. In Roman mythology, Flora symbolized nature, flowers and fertility. Fauna was the Roman goddess of animals, wildlife, fertility and Spring. Sense, the word Fauna designates animal life. What does Flora and Fauna mean in today's world? How do you relate to nature in today's technological environment? CNAS invites artists in all mediums to interpret their definition of Flora and Fauna, and is open to all." go to www.callforentry.com (enter core new art space in the finder window) or link to CaFE through the www.coreartspace.com website.